Plot When a father wants his daughter to be a hardened Indian secret agent and spy for the nation, he marries her off into an elite Pakistani military family, where the girl, now a trained spy, does not deter from her duty towards her nation, nor does she let her in-laws doubt her presence in their home in general and their country in particular. Not all superheroes wear capes; some even wear the Tiranga! This is exactly what sums up the just released ‘Raazi’, a spy thriller, which stars Alia Bhatt, who has been pushing the envelope of her comfort zone with each film she’s appeared in. Based on a true story and adapted from Harinder Sikka’s 2008 novel “Calling Sehmat”, the film is a fictionalized account of the story, which saw a woman at the helm of things during the Indo-Pak war of 1971. Settled in Kashmir and concerned about the worsening situations between both nations, Hidayat Khan (Rajit Kapur) wants his naïve daughter Sehmat (Alia Bhatt) to become a resilient Indian undercover agent, who will be sent across the border to spy on top officials and extract information, which would help Hindustanis be one up on the Pakistanis. But all of it will come at a huge cost. The young and inexperienced girl will have to undergo rigorous training sessions under Indian Intelligence agent Khalid Mir (Jaideep Ahlawat), who prepares her for the tough journey ahead – both physically and mentally. Sehmat is then married off to a young Pakistani Army officer Iqbal Syed (Vicky Kaushal), whose father was Sehmat’s friend in college long before Partition. Sehmat quickly adapts herself to the new life in the high-ranking military household, yet she never forgets her duty towards her country at any given point. She has her eyes and ears open at all times and is aware of everything that goes on in and around the household, where vital information could come in from. But then, nothing worth having comes easy and Sehmat has to pay the price for it; or does she! ‘Raazi’ is an espionage thriller yet it has its subtlety in place and only a director like Meghna Gulzar could handle a story with such sensibility. There are no guns blazing or bombs ticking off in the two-hour-plus movie, nor does it give speeches about love for one’s motherland or talk about patriotism, despite the film having deep undertones of the same. It follows a different route altogether and the result is for everyone to enjoy. ‘Raazi’ might be a film which is set against the backdrop of a war, but it does not wear you out with its war proceedings not does it become too preachy. It has its heart and soul in the right place. Alia Bhatt has proved her mettle once again in a film that is not mainstream Bollywood. When she appeared as a bimbo in her debut movie, all one thought of her was that of an eye candy. But the girl demonstrated extreme talent with each of her movie and we are proud Alia was “Sehmat” for ‘Raazi’. Her stellar performance, backed by her supporting cast in the form of Rajit Kapur, Soni Razdan, Shishir Sharma and Arif Zakaria is simply outstanding. Alia and Vicky Kaushal make for a fresh chemistry and the actor shines in a woman-oriented movie without a doubt. The surprise package of the film however, is Jaideep Ahlawat, who plays Alia’s mentor, her handler and her secret admirer with great ease. The tall and handsome actor matches Alia’s performance to a T and gives us proof of his merit with the film. Technically the film is sound and doesn’t go overboard with its goings-on. Meghna Gulzar has etched out all her characters wisely and each of her actors breathes life into their roles. The story is riveting and unlike most spy-thrillers, which become predictable after a certain point, ‘Raazi’ keeps you glued. 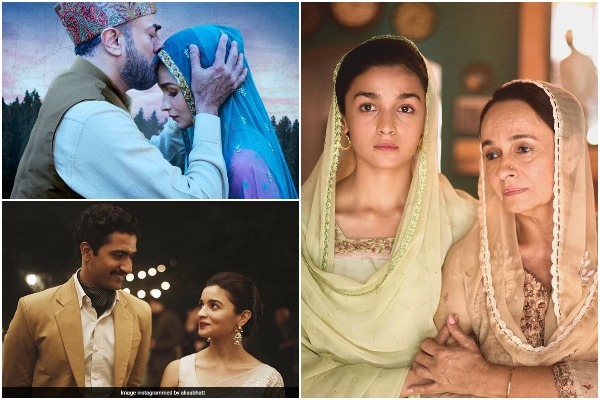 It packs quite a punch and with lyrics from the pen of Gulzar and Shankar-Ehsaan-Loy’s music that matches the era the film it is set in, ‘Raazi’ becomes a clear winner. To sum it up, be raazi to watch the film and be sehmat with us that the film is worth all your time and money!